If I were to produce a list of the 100 most exciting discoveries made in tetrapod zoology within the last few years (which I won’t), then up there in the top 20 - at least - would be the Kayan Mentarang animal. Or, in fact, it would have been up there in the top 20 (at least) for, as we’ll see, a new study has demoted somewhat the potential significance of this creature. 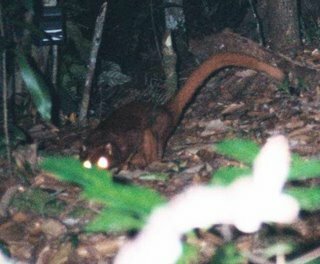 You’re doubtless already familiar with it (even if the name Kayan Mentarang doesn’t sound familiar): it’s that unusual reddish long-tailed mammal, photographed by a team from the Swiss World Wildlife Fund at a camera-trap in central Borneo, and widely hailed as a probable new species. If you’re wondering, ‘Kayan Mentarang animal’ is not this creature’s official name: it’s a label that I’ve invented, and one that (in my opinion) is clearly superior to the various other labels that have already been given to the creature. Some writers have referred to it as a cat-fox, while one newspaper article jokingly suggested that it be termed the ‘cat-dog-fox-monkey-lemur’. Though the two photos that feature the Kayan Mentarang animal were taken in 2003, they were not made public until early December 2005 (the second photo, showing the animal from behind, is featured at left). I don’t know why this postponement occurred, but such delays are fairly ordinary given that scientists are often really, really busy, or hesitant to announce controversial news. Then again, some news is deliberately held back until its release might have the most impact. I don’t want to seem cynical so will stop there, but it’s probably not a coincidence that the discovery was announced at the same time as was news that the Indonesian Government plans to start an oil palm plantation in the vicinity of Kayan Mentarang National Park. During December 2005 and January and February 2006 features on the Kayan Mentarang animal appeared in most newspapers, in most science magazines, in Science (Holden 2005), and on TV. Led by Stephen Wulffraat, the WWF team confirmed that local people were unaware of the creature, and they also noted that none of the mammalogists they’d consulted had been able to identify it. While some biologists noted a vague superficial similarity with lemurs, most concluded that it was a viverrid: a member of the same carnivoran family as civets and genets*. Many viverrid species are highly enigmatic and several have only recently been discovered, have only occasionally been photographed alive, or have even not been photographed alive at all (for a nice review see Schreiber 1989). * Though note that recent phylogenetic studies have agreed that the traditional Viverridae is not monophyletic. Nandinia is not close to civets and genets, but is in fact a basal feliformian (Flynn et al. 2005); oriental linsangs (Prionodon) are not viverrids, but in fact the sister-taxon to cats (Gaubert & Cordeiro-Estrela 2006, Gaubert & Veron 2003); and Madagascan carnivorans are also not viverrids, but closer to mongooses (Gaubert et al. 2005). 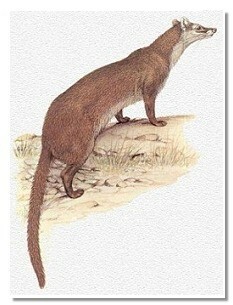 Thanks to its long tail, gracile proportions, size (comparable to that of a house cat), and general civet-like appearance, the Kayan Mentarang animal soon became widely regarded as a probable new viverrid. The adjacent painting is a widely-reproduced image, produced by Wahyu Gumelar for WWF Indonesia, depicting the animal as a new, hitherto unknown viverrid. The idea that the Kayan Mentarang animal might be a hitherto-undiscovered species is exciting and easy to take seriously, given the size of Borneo (third biggest island) and the continuing discovery there of many new species. However, some authors were prepared to go further and be even more precise in their identification, and by far the most popular and widely reported identification has been that the Kayan Mentarang animal in fact represented a known species of viverrid: namely, Hose’s civet Diplogale hosei (also known as Hose’s palm civet or the Brown musang) [see image below]. Named in 1892 and known from less than 20 specimens, this is a poorly known terrestrial viverrid of montane forests, and good observations and photos of it are few and far between. Arguing that the Kayan Mentarang animal and Hose’s civet were anatomically similar, Chapron et al. (2006) proposed that the alleged new carnivore ‘may not be new’. They clearly weren’t entirely convinced by their own explanation however, as they also noted that the Borneo bay cat Catopuma badia (another highly elusive carnivoran: named in 1874, it appeared extinct during the 1980s but was rediscovered in 1992) might also be the true identity of the cryptic creature. Identification of the Kayan Mentarang animal as Hose’s civet was also preferred by some cryptozoologists (Loren Coleman blogged about this at cryptomundo: go here). Oh yeah: happy new year! Chapron, G., Veron, G. & Jennings, A. 2006. New carnivore species in Borneo may not be new. Oryx 40, 138. - ., Wozencraft, W. C., Cordeiro-Estrela, P. & Veron, G. 2005. Mosaics of convergences and noise in morphological phylogenies: what’s in a viverrid-like carnivoran? Systematic Biology 54, 865-894. Schreiber, A. 1989. 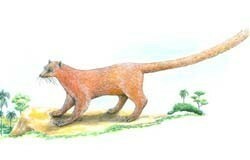 Mysterious mustelids, very mysterious viverrids. BBC Wildlife 7 (12), 816-823. It's CLEARLY a very small brachiosaurid. ...those aren't eyes and that's no mammal. It's actualy a very small, long-necked dinosaur with two glow-in-the-dark testicles. Honestly, some people will believe anything! Those who don't know their history are condemned to repeat it (or whatever). W00t! Looks like a great start to a new year. is their a cat-fox on here?